Monday July 3 saw the launch a new booklet which marks the start of a new public information campaign aiming at reducing the stigma that surrounds suicide. The booklet was launched at the Saint Patrick’s Centre in Downpatrick by the locally based Suicide Down to Zero group. Spokesman Pat McGreevy said “We in Suicide Down to Zero believe that: – most, if not all, suicides are preventable; everyone can make a contribution to saving lives from suicide and that the goal and ambition in Northern Ireland should be zero suicide deaths. Indeed if t we do not strive for zero suicide deaths what is the acceptable number of suicide deaths we should expect. An `acceptable level of suicide` approach prompts question as to who then will survive and who will die by suicide. 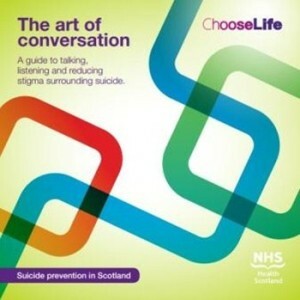 In the “Art of Conversation” readers are guided to recognize the myths and facts about suicide; learn more about some key information about the extent and nature of suicide in Northern Ireland; follow the ALERT process in talking to someone about suicide; start difficult conversations; become a better listener with five steps to active listening and learn more about training and useful contacts and resources. The “Art of Conversation” has been localised and reproduced with kind permission from NHS Health Scotland a copy of which can be access here.